I never expected I’d be at all interested in homebrew. I enjoy beer, but just as much as anyone else and the long process of creating a drinkable homebrew seems a lot like work. Packaging design is fantastic fun though, and I rarely get the chance to do any. Talking with a coworker about his homebrew hobby got me thinking that with a little effort, the resources are out there for me to learn the craft fairly quickly and make the kind of beer I like to drink. I could then follow this with some label art and fling bottles of free beer at my more tolerant friends. 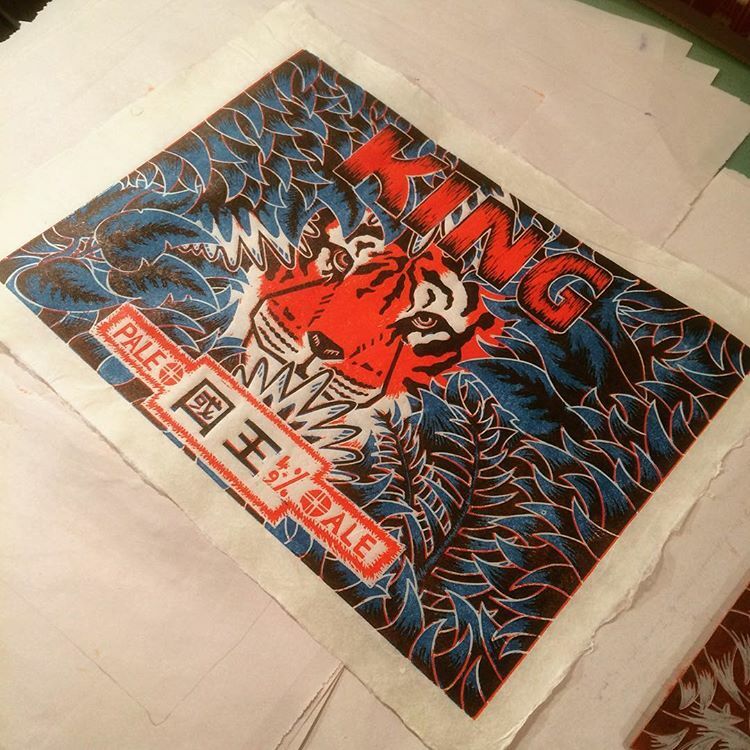 I have a lot of linocut and relief print material lying around and for a while I’d been considering making some stamps or packaging labels of the sort you see on wine and beer bottles. I’ve been wanting to get back into using the stuff and there are plenty of examples of really successful designs out there. I’ve kind of lost touch with my original aim, having brewed by first batch of beer using the process outlined below. The result has been rather average, but given I expected catastrophe I’m keen to keep going. I’m focusing on producing a good product before starting on the design, rather than working the other way around as originally intended. Given my thoughts are scattered, this blog serves as a good platform to document my steps and missteps to refer to later on. It might also provide some handy for other newbies provided I’m clear in what I say. Queensland is kind of a hot and crappy place for brewing beer when you need to store things at around the 21C mark. Solving that should be interesting. The clearer my documentation, the fewer my mistakes in future. I headed to Brewer’s Choice in Stafford to pick up everything I’d need to start. I was hoping to purchase a Cooper’s kit, as it was suggested by a coworker and I’d seen some videos covering usage. 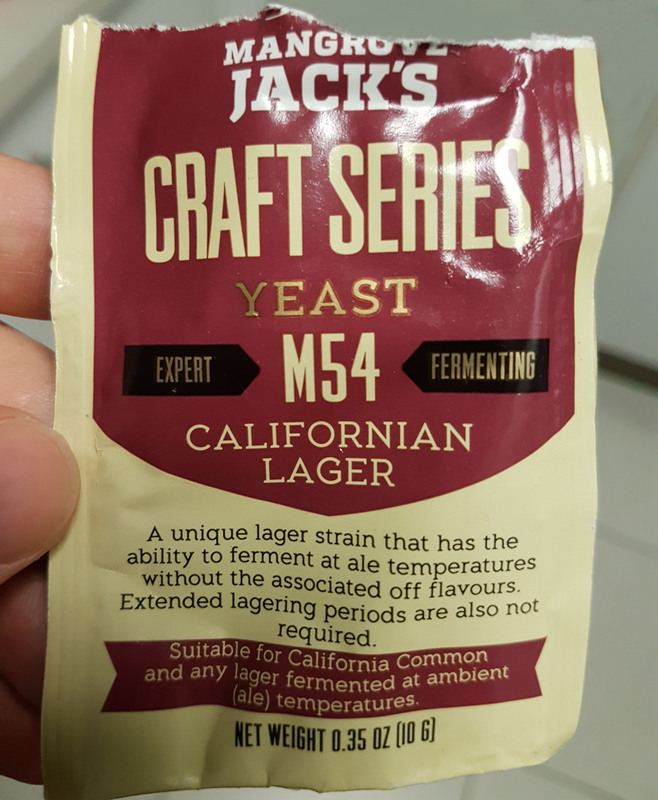 They had a Mangrove Jack’s homebrew kit, packaged with a liquid malt extract (LME) pack with everything needed to make a Golden Lager. I purchased this instead, as the fermenter design was still large enough for my needs. This was a good decision as the fermenter is a more standard and less fiddly design than the Coopers kit. 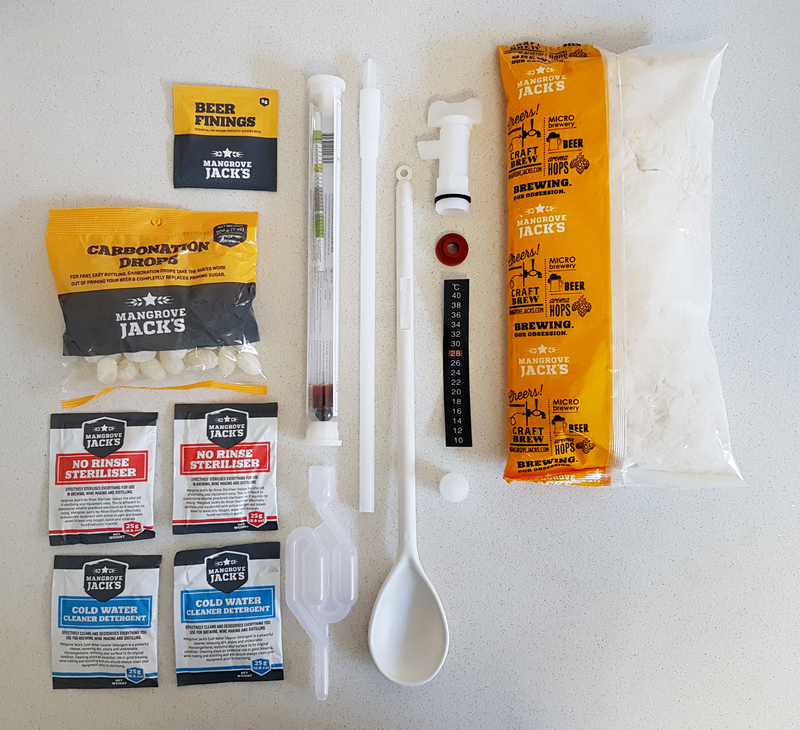 Here are some of the contents of the kit, barring the malt extract and the fermentation vessel. From the left are finings for clearing the fermented beer, carbonation drops to carbonate the beer in bottles, detergent and steriliser for cleaning before the brew. The kit also includes a hydrometer for measuring attenuation and specific gravity, a cheap airlock, bottling tube with valve, stirring spoon, tap for fermenter, bung to seal airlock to fermenter lid, stick on thermometer andsediment reducer to fit to tap. The pack of malt for the first brew is on the right, and the fermentation vessel and LME pouch aren’t shown. The kit included everything for the first batch, but I purchased additional malt and carbonation drops for the next batch, along with some EGA Cleaner and Star San for cleaning between batches. I purchased an additional LME pouchh, a Mangrove Jack’s Australian Pale Ale (including yeast and dry hops), to brew once I’d almost definitely botched this first practice batch of lager. 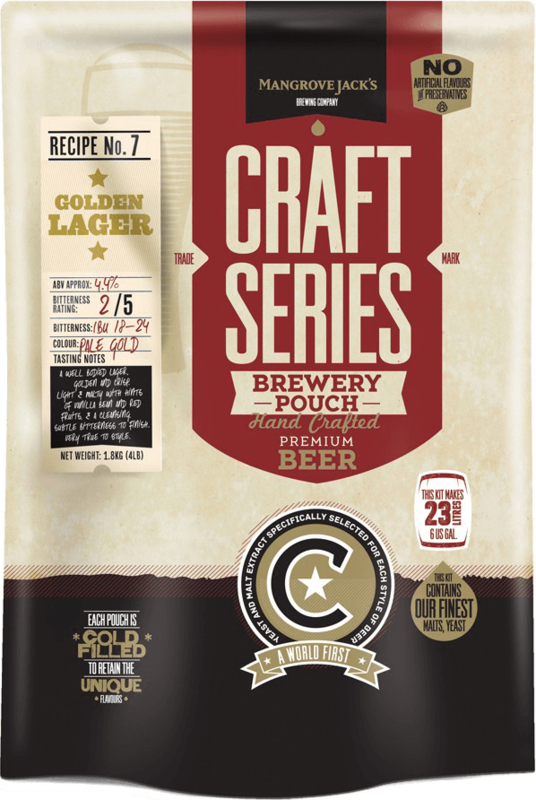 A LME Golden Lager made with the kit packaged with the Mangrove Jack’s Traditional series starter brewing kit. My initial thought is that the lager included with the starter kit doesn’t seem sensible for a starter homebrew. Lagers require specific fermenting conditions which are hard to reproduce in a Queensland summer. Those getting into homebrew tend to stray away from lagers until later on. Lagering is the process of storing beer at temperatures of around 14C for months on end to condition them. Fermentation temperatures are also generally a lot lower than ales. We barely hit 14C as a low in winter a lot of the time. I resigned myself to not meeting the temperature requirements and decided to give it a go anyway. It was a good practice run for future batches. Avoid rookie mistakes — See what people always do wrong the first time and don’t do those things. Make drinkable homebrew — It doesn’t have to be amazing, but make something that isn’t infected or horribly warped in some way. Note every mistake and research whenever uncertain — Its better to mess up the first brew in the process of learning to do it right the second time, so prioritise that. Figure out which guidance to follow — Everyone has something to say about which processes work best and it seems that the instructions always give different guidance to the community. In this first instance the only equipment I needed in addition to the homebrew starter kit was for bottling. I purchased two crates of 15 PET bottles with caps, which did a pretty neat job holding everything once done. There was no need for a big urn or pot, as the “boil” in this case is done right in the fermenter. The kit included 1kg Brew Enhancer, along with carbonation drops and finings. I thought it best to avoid any variation this first time around to make it easier to identify the cause of any problems with the result. 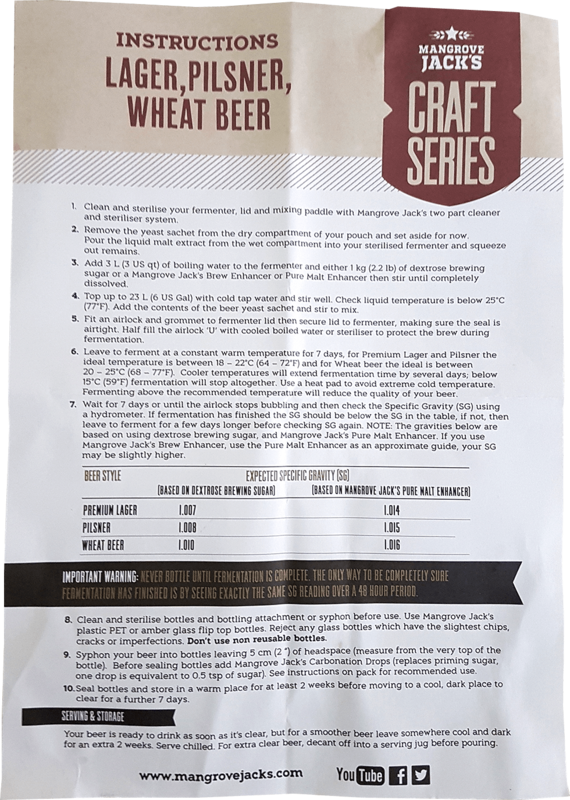 The included instructions were a little crazy, suggesting fermentation times of around a week which didn’t line up with anything I’d read. The instructions weren’t specific to the kit either. This was a little frustrating given the whole selling point is how idiot-proof the pouches are. I kind of wanted to just blindly follow the guide and see what the result was like. That being said, outside of temperature control everything was really easy to follow. Step four is a little frustrating. “Check liquid temperature is below 25c” isn’t much help when this isn’t the case. Posh Nosh provide similar guidance in the case where you’re trying to bake vegetables without an auger. I followed the instructions for the process of preparing the wort for fermentation, but then went to forums and online guides for the fermentation process. Bottling beer before fermentation is complete can result in too much pressure buildup inside the bottles, resulting in explosions and mess. The brew took more than an extra week to finish fermentation so I’m glad I didn’t go by their book. I didn’t follow all the proper steps for sanitisation. There were a few ways in which the brew could have been contaminated but there was no contamination that i could detect. I dropped the open fermenter in the ice bath, resulting in a few drops from the bath splashing into the fermenter. The LME requires only a very quick and basic process for preparation — pour in, add boiling water, aerate with a spoon and top up with water to bring to pitching temperature. Unfortunately the water in the tap on the hot day was above the pitching temperature. I ended up having to add ice directly to the brew to bring it down while in an ice bath. I used an unsanitised kettle to boil the water, which is fine as the heat should kill any contaminants. The kitchen tap provided all the water to begin with, so any contamination in the water can’t be avoided unless I find a way to store 20l of boiled and cooled water. In hindsight, i should have had a bunch of sanitised milk containers with refrigerated water on hand to bring the temp down. It was very difficult to get the wort down to pitching temperature, and I used all the ice available, both in the ice bath and by placing some large chunks of ice in the wort itself, to bring it down to a temperature that wouldn’t kill the yeast. I ended up pitching at 32 degrees, way above the required 26. Luckily this didn’t kill the culture, however it may have affected the flavour. This process also took an hour or so. 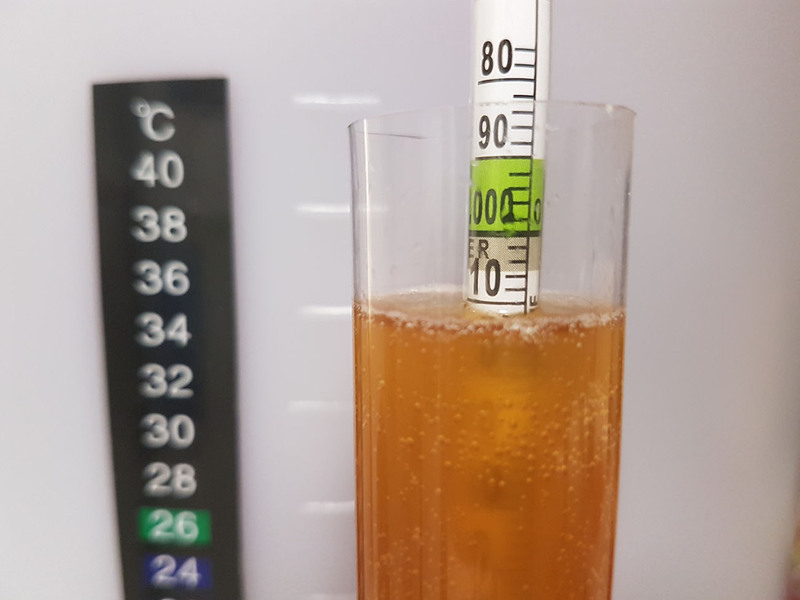 It’s best to keep the cooling time as short as possible, as between starting and pitching temperatures, contaminants are able to form off flavours in the beer. It took several hours to get the temperature down to 26 degrees. I placed the fermenter in shallow water in the laundry sink, before draping it with a damp towel. I had an old USB fan lying around which ran constantly for the two weeks of fermentation. The result was that the temperature sat at around 3 degrees below ambient at 26C. I’d prefer not to have a powered device so close to water, and not to have something draining power constantly over the period. Additionally, 26 degrees really is the upper limit of whats acceptable and I would prefer to get the temperature down to 21 if possible. It would also be good to be able to use the laundry sink again. 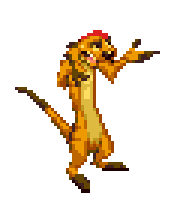 I learned upon later examining the relevant Mangrove Jacks page that the yeast used is supposed to be kept in fermentation at below 21 degrees. For some reason the kit instructions specified a temperature of 18-22C. Irrelevant to my case anyway as I was fermenting at stupid high temperatures. I’m going to focus more on the yeast information in later batches. Pretty chuffed I didn’t kill the whole lot of it really. Temperature control was pretty poor. I mean I tried… but its fairly difficult to know what you’re going to need. We also had a heat wave in Brisbane at the time and it was the middle of summer so the odds were stacked against me. I kept a damp towel over the fermenter with a fan directed towards it as a basic swamp cooler setup. This would have worked better, were it not also of course uncomfortably humid. I need to come up with a better solution. Finings were added on bottling day, meaning they only had a few hours to work through the batch — far less than the few days recommended. The beer was pretty cloudy as a result, however over weeks it cleared quite a bit on its own. In fact by week four of bottling, the beer is completely clear. I forgot to take an initial hydrometer reading so I have no idea what the real final ABV. I was concerned that the final SG was below what was suggested in the kit instructions. The expected final gravity was 1.014 based on the recipe, however I bottled at about 1.011. I’m not skilled or knowledgeable enough to know what caused this discrepancy. A wild yeast might have been to blame, though this tends to introduce strange flavours and none were strongly detectable. Wild yeast tends to be blamed for higher alcohol content as its able to consume and convert more sugar into alcohol than brewing yeasts. The poor temperature control might have contributed as well, though I’m not sure how. I just know temperature control was definitely what I messed up the most this first time around. I tried a few different things while bottling to see whether there was a noticeable difference in the result. I marked the first and last bottles taken from the fermenter, to see whether there was a difference in flavour or sediment. I also took one of the bottles and refrigerated it for a day or two before placing it in the cupboard to carbonate with the others. The bottles I was using were brand new and seemed very clean. I skipped sanitising two of the bottles to see what kind of infection risk this raised, placing a little bandaid on each in the absense of proper labels. Having tried one so far it doesn’t appear to be an issue for new and unused bottles. I stored the bottles for a few weeks at around 28 degrees before drinking. I’d love to have a more appropriate climate to mature the beer in, but as with fermentation I’m kind of limited without specialised tools to just ice blocks and fans. One of the frustrations of homebrew is constantly cleaning out bottles, so one day I might be able to keg instead, which would make it easier to just store in a fridge. Very bland beer but with very little detectable abnormality. Head retention is really poor, which can be helped a little by drinking from headmaster glasses. I might have left too much space in the top of each bottle. Logically having less space would encourage more of the CO2 to saturate the liquid. That, or blow the tops of the bottles off. After three weeks the beer has cleared almost completely which is rather cool. I opened the first bottle I filled and found it was still very cloudy, which is to be expected I guess, given it would collect sediment floating near the bottom. I haven’t noticed anything off in any of the bottles I’ve marked. The unsanitised ones didn’t get infected. The ones at the start and end of the pour taste the same really. One beer tasted a little more off than the others and I found an imperfection in the plastic, so I’ll throw it out. The bottles hold so much bloody beer that I can never open more than one at a time to compare without risking getting drunk. It tastes like cheap lager with a slight unpleasant fruity aftertaste. The off flavour is so slight as not to really be noticeable though. This might be the homebrew twang people talk about. I’m not quite sure what that actually is but I assumed it would be metallic. If it were a type of beer I enjoy I think I’d be happy with it. It’s not beer I’d proudly give anyone, but I’m happy enough that it achieves all the aims of the basic recipe and process underlying it. I made something drinkable and avoided mooost rookie mistakes. I don’t need to add finings at all, as they are made from gelatin and only affect aesthetics. I can just get a filter sometime down the line instead. Alternately I can use whirfloc once I have a boiler for better brewing. I need to remember to measure starting gravity on brew day. Then I can figure out alcohol content when fermentation is done. Kit instructions show you how to make beer fast. The homebrew community will show you how to make beer well.